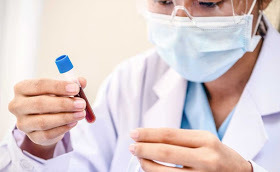 Scientists have developed a blood test that could measure how much time you have left to live. The study is one of countless research programs around the world currently underway to develop the best "life calculator", which would be able to quantify the age of your cells as opposed to your "age" chronological". Researchers at Yale University behind this new paper insist that their measurements offer the most accurate, practical and easy-to-interpret result of any study to date since they have widely used factors that are measured in a annual physics. They say the results could easily be translated into a 23AndMe style test in the near future. But unlike genetic tests, these results are not engraved in stone. Lead author Dr Morgan Levine, a pathologist at Yale, told Daily Mail Online that his next goal was to identify the factors responsible for cellular aging so that doctors can help their patients extend their life by adjusting their diet or their habits. "In young or middle-aged people, everyone thinks they are healthy and well, but that's not always the case," Dr. Levine told Daily Mail Online. "This test could actually tell people their real risk, so they can monitor these factors before they become a problem." Most of the previous studies in this field have taken a microscopic approach, dipping deep into cell makeup to determine their molecular age. Dr. Levine, too, has done some work using these kinds of measures. But this time, she sought to see how readily available measures, such as blood glucose levels, could do the same thing. "Basically, it's more of a measure of physiological age, rather than a measure of molecular age. This shows us the manifestation of all these changes, "says Dr. Levine. "I find that they are better predictors of life expectancy than more molecular measures, because they actually capture elements of the aging process. "They say that there are seven pillars or features of aging, and many of the previous studies focus on just one of these pillars, which includes several hallmarks. The blood test is based on nine biomarkers. To determine which biomarkers deserve to be followed, Dr. Levine's team analyzed 42 different measurements available in the NHANES (National Health and Nutrition Examination Survey) large dataset, a set of studies that tracks thousands of Americans for years. They selected 10,000 people between 1988 and 1994 and identified factors that appeared to determine their risk of death. They then examined another set of 11,000 people between 1999 and 2010 and did the same. Finally, they used an algorithm called the "elastic net model" to measure the strongest predictors and landed on nine biomarkers, including white blood cell counts and globular protein levels. "It worked very well," said Dr. Levine. "Many studies do not really compare if their measurement is a better predictor of mortality over chronological age, so we compared ours to others. We found that it predicted better. She added, "I think the good thing about the steps that go into this area is that they usually measure in a physical when you go to a doctor. Many people probably have their lab results for most of them. You can simply enter your data from your last physical and get your reading. The next step, and one that Dr. Levine is most excited about, is developing concrete ways to show how a person's lifestyle could accelerate their biological age faster than it should be. His team is conducting an ongoing study to understand what contributes to differences, from lifestyle factors to genetics to socioeconomic factors. In fact, they already have preliminary evidence that different dietary habits, reduced BMI (within reasonable limits), stopping smoking, and increased physical activity may reduce biological age. "You could really try to guide people to improve on that basis," said Dr. Levine.